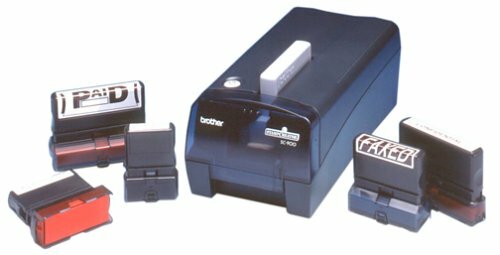 With the Brother SC-2000 professional stamp creation system you can make a stamp with almost everything you can put on your computer screen, whether you have a Macintosh or PC. Take graphics, text, clip art, logos, signatures, even photos, and turn them into professional-quality rubber stamps. Or choose from the 150 preformatted designs that come with this unit. Once your design is established it will take about one minute to transpose into an actual rubber stamp surface. Choose from 11 different stamp sizes. The preinked stamps you create mean no separate messy inkpads. Re-inking bottles of nontoxic, nonflammable, and quick-drying ink make refilling and printing quick and clean. Choose from four different colors--black, red, blue, and green--to make your creation. The rubber stamps are designed with microporous control so you get the same amount of ink transfer with each impression. They're durable so they will take heavy, repeated application. The stamps have a high-tech look with translucent color holders, making them as appealing as they are functional. Whether you will use these stamps for stationery, mailing, copying, office equipment, or to sell your own stamp designs, you'll have fun and experience satisfaction creating reliable, high-quality stamps. At first this machine looks promissing. But the software support is bad. It has a problem with the serial connection. Plus the image editing software needs more improvements. This mahine is a great addition to my profit centers in my small business.Since I have purchased I no longer need to out source my stamp business.This machine is easy to use and works every time! This machine has saved me so much time and money!This machine creates high quality stamps far superior to stamps that I have been previously ordering that take 2-3 weeks.I can now make my own stamps in house and at a cost 1/5th of what I was paying to have stamps made.I have owned this machine for over 9 Mo. and have had no issues.Brother does provides a support phone # specifically for this machine and supported me wonderfully with the one simple question I did have. 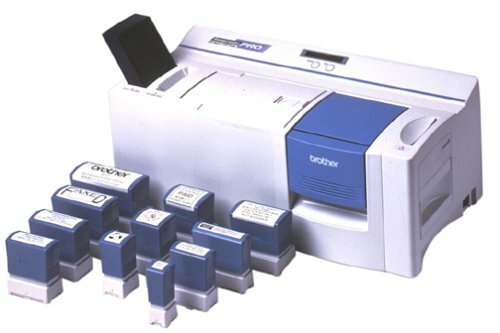 The Brother SC-900 stamp creation system enables you to make professional-looking stamps that can save you time and energy. Why write the same thing over and over again when you can just stamp it! Offering high-quality stamps, the SC-900 is compatible with either Macintosh or Windows operating systems. Over 100 stamp templates are included, along with 700 clip art designs. This unit uses preinked pads and thermal silk-screen technology.